Remember Remember the 11th of March, the 28th of March, the 3rd of April, the 26th of April, the 6th of August, the 29th of September, the 10th of October and the others…. and…all the US Cities Reporting Radiation Above 1000 CPM! All Nuclear Reactors Leak All of The Time. Note: Meltdowns are Not Leaks. Take all necessary precautions! #DodgeRadSNOW #DodgeRadsNOW. Read, Share & Subscribe or Bookmark! Across the United States from East to West and North to South, this is Your Radiation, This Week. What does the Rad mean? The radiation measurements are much higher today than years ago. The radiation from nuclear bomb detonations and reactors has been falling to the ground for these past 70 years. The radioactive products last millions and in many cases billions of years. For us, the Rad lasts effectively, forever. Although we can’t see it, taste it, smell it or hear it we can measure radiation and observe its effects. One way to measure radiation which the United States Environmental Protection Agency [EPA] has chosen to use on its radiation websites is in Counts Per Minute. Each Count is One Radioactive Decay. A radioactive decay occurs when a radioactive isotope annihilates itself in a radioactive explosion. This happens on a regular and methodical basis. It is worse when the explosion happens inside of you. People working for governments have devised ways to make use of this property of radioactive isotopes in nuclear bombs and reactors. For example, 50 CPM is 50 Counts Per Minute [CPM] or 50 radioactive decays per minute. A related measure is Counts per Second [CPS.] 50 CPM is the same as 0.833 CPS, it is a per minute value divided by 60 seconds. Fifty CPM is an alert level and has been for years for people around radiation. The alert means that the radiation level is higher than it should to be. The Radiation Levels recorded by the EPA in the American cities listed above this past week are well beyond the old days and an alert level of 50 CPM. This radiation is not the kind of pollution than can be diluted or disappears by itself in a few days or years. The “longed lived” radiation lives much longer than this Planet will be around, according to astronomers and physicists. This entry was posted in "Bob Nichols - Project Censored Award Winner - Contributor to various online publications. Bob Nichols Said What Else!?! 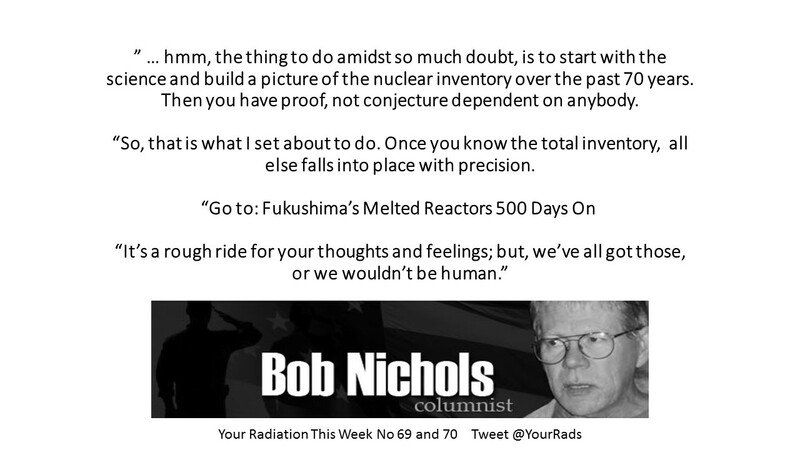 ", "Bob Nichols Said WHAT About Your Radiation This Week!?! ", Nuclear, Radiation, What Else?, Your Radiation This Week No 1 - 86 and tagged "Evacuation and Extinction Evacuation and Extinction – we need to talk about this. This is a very real likelihood for us all. ", "Have a wonderful radioactive weekend and remember to Dodge the Rads- it’s dangerous out there. ", #BadAirAlerts, #DodgeRadSNOW, #DodgeTheRads, #OccupyVirtually - It's dangerous out there!, Follow on Twitter @YourRads, Follow on YouTube at Nichols On Nuclear - Fukushima and More, WE ARE THE MEDIA NOW, YourRadiationThisWeek.org. Bookmark the permalink. ← Fukushima’s Melted Reactors 5 Years On !! !